Garment labels are the quintessential marketing tool. While many view them as a throw-away item, in reality, they are the key to gaining customers and hiking up sales. Labels are your voice, conveying pertinent information about your collection, one shoppers hear loud and clear. From logo design to handling and care, the label you choose to represent your brand can make all the difference when it comes to sales. It is a well-known fact that when it comes to clothing, shoppers look at everything, including the labels. So it is important to choose labels that best reflect not only your line’s style, but also its quality and integrity. 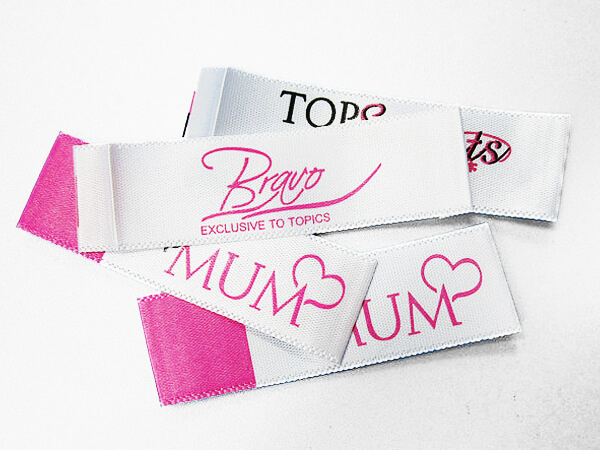 And one of the best ways to that is with our printed clothing labels. Crisp, vibrant and stylish, they will bring your clothing to life. We specialize in all types of printed labels, using the latest materials and expert applications to give you the finest product on the market. Silk, cotton and satin are just some of the materials we use, and we won’t just create your labels, we’ll guide you on style and placement too. Here at Sun Tat we have only one goal: to provide you with labels that exceed expectations and give you professional and friendly service that goes beyond the ordinary- just like our labels. 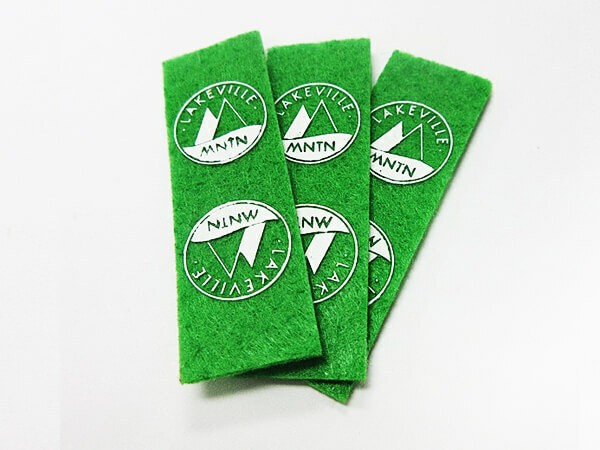 Custom printed labels can be made in fabrics similar to woven labels, including damask, silk and satin. Designers love using them because they are practical, yet stylish, creating bold, concise logos and information labels that can be made in extremely small fonts. They are also convenient, as they can be placed on various areas of the garment, for precise positioning. Smooth, sleek and eye-catching, they are a budget-friendly way to give collections a finished look that is pleasing and functional. Printed labels, when done right, can increase sales and help you gain customers through their pristine appearance and durability, all at a price that won’t break your budget. Labels tell your garment’s story, so you need ones that are easy to read, yet engaging, which is exactly what printed labels do. Practical and straight-forward, they can showcase your brands one-of-a-kind logo as well as impart critical information. They can be used for sizing and material information, how to care for it, and even what your line stands for, which are the main buying points in retail drawing them in and making them want to buy them. They also can be placed in different spots, like the neckline or side seam, so consumers see what you want, where you want. For example, you can place your logo and sizing by the neck, giving your garments instant recognition (great for buyers with limited shopping time), or place care instructions on a bottom tag, so it is easy to see but not the focal point. Like your garments, they can be made to your specifications, giving you creative control from top to bottom. These labels show shoppers your garments are well-made and worth the investment, step one in drawing and keeping customers. You see, poor-quality labels say to shoppers that you don’t care enough to invest in your line, so why should they. By using printed labels, you’re letting them know that you think your customers are worth it- and so is your collection. Printed labels blend with your line and stay fresh, showing shoppers they are just as good as the clothes they’re on. Neat, clearly written labels eliminate guesswork and will make customers more likely to buy your product. 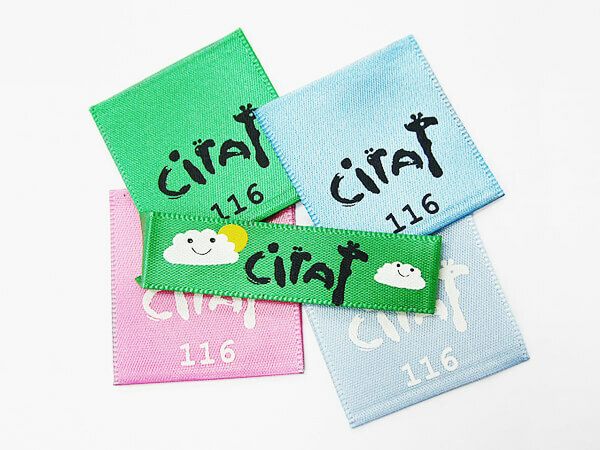 Printed labels can be made using different materials, techniques and finishes, the most popular being satin and cotton. Your label should enhance your line, so the material should be compatible and stand out when necessary. For instance, you may want to use a satin label for a logo label that is going in a prominent place, like the bottom front hem or front sleeve. Your aim is for your label to look like it belongs and is a natural extension of the garment. Satin Labels: This is the most widely-used label, as the satin is super soft and highlights text for reading that is easy on the eyes. Available in 4 background colors: white, cream, grey and black, it can be printed on using a wide range of colors, so it can reflect the garments style and color-scheme. Perfect for inside tags because it feels natural against the skin, it is great for directions and material information. Canvas Labels: Canvas, or cotton labels, are known for their durability and their ability to absorb a wide range of colors and designs, making them ideal for brand designs and flourishes. Using the silk screening process, the finish can look shiny and super luminous, for a more upscale look. Canvas labels are great for front logo labels or any other label you want to stand out. Nylon/Tyvek Labels: These labels look and feel like paper, but are stronger and great for side labels with care instructions. Available in black or white backgrounds, they are made for fine print and work best as an information label. Rotary Printing: Rotary printing is the most commonly used technique, as it can be used on multiple fabrics (Canvas, Tyvek, Nylon) and there are a multitude of colors that can be inked on. Esteemed for its durability, it provides a crisp, neat background that doesn’t fray or unravel. Using heat to seal the ink into the material, it is affordable, but still pleasing to the eye. Silk Screen Printing: A proven technique that dates back to the early 1900’s, this is the top choice of designers thanks to its smooth look and ability to stand up to repeated washings. These labels will not fade or rip over time and are able to stand up to sun exposure, harsh chemicals and more, making them perfect for clothing labels. Used mostly with canvas or cotton labels, ink is applied layer by layer to the material, so it is permanent and does not bleed as its applied. Multiple colors can be used for intricate designs, giving you versatility and practicality all in one package. Sun Tat is dedicated to providing you with the best printed labels you can find, all at bargain prices. , We pride ourselves on our exemplary work and will provide you with nothing less than perfection. Just as your labels are your garment voice, we are yours and will make sure your vision becomes reality. View our work to see all we can offer and please contact us with any questions. Whatever you need, we can give you.